Karl Marx, The New-York Daily Tribune. 22 July, 1853. The story of the Sepoy War of 1857, (an attempt at a compromise between two more controversial titles, ‘the Sepoy Mutiny of 1857′ and ‘the Sepoy Rebellion of 1857,’ though “insurgency”might also fit) began long before March of 1857. The history of the war delves deep into the colonization and conquest of India and the cultural and religious oppression imposed on Indians by British rule. Furthermore, the telling of the history of the war is, to this day, an ongoing battle between two competing narratives, the history belonging to the British that won the war, and the history claimed by the Indians who were defeated. This article is an attempt to present a history of the Sepoy War that is derived from various points of view, accounting for the context of the histories related, and the points of view of the historians relating them. The East India Company was a massive export company that was the force behind much of the colonization of India (See Spice Trade in India). The power of the East India Company took nearly 150 years to build. As early as 1693, the annual expenditure in political “gifts” to men in power reached nearly 90,000 pounds (Marx 23). In bribing the Government, the East India Company was allowed to operate in overseas markets despite the fact that the cheap imports of South Asian silk, cotton, and other products hurt domestic business. By 1767, the Company was forced into an agreement that is should pay 400,000 pounds into the National Exchequer annually. In order to consolidate and control these new holdings, a well-established army of 200,000 South Asians officered by 40,000 British soldiers dominated India by 1857. The last vestiges of independent Indian states had disappeared and the East India Company exported tons of gold, silk, cotton, and a host of other precious materials back to England every year. Furthermore, historians taking similar positions argue that British legislation that interfered with traditional Hindu or Muslim religious practices were a source of antagonism. Palmer and Kaye also argue throughout their respective work that the prohibition of practices such as saathi (often transliterated “sati”), or the ritual suicide of widows on their husbands’ funeral pyres, became a source of outrage. In other words, the growing intrusion of western culture became an impetus for rebellious soldiers, fearful that their culture was being annihilated. The long-belabored significance of the Lee-Enfield cartridge is challenged by the work of historians like Marx, Collier, Majumdar, Chaudhuri, and Malleson. These historians argue that the actions of soldiers at Meerut were the “last straw” for South Asians who had been victims of British cultural and class-based oppression and antagonism, and discard the notion that religion played an overwhelmingly vital role in fomenting revolt. For them, the root causes of the insurgency cannot be traced to a single, well-defined set of events and causes, but rather stemmed from an ongoing set of conflicts. Participating in the military conquest of local authorities, then, and having first-hand knowledge of the effects of British expansionism would have fomented resistance in the Sepoys. On August 28, 1857, Marx published an article in The New York Daily Tribune in order to “[show] that the British rulers of India are by no means such mild and spotless benefactors of the Indian people as they would have the world believe” (Marx 72). Marx cites the official Blue Books — entitled “East India (Torture) 1855-57″ — that were laid before the House of Commons during the sessions of 1856 and 1857. The reports revealed that British officers were allowed an extended series of appeals if convicted or accused of brutality or crimes against Indians. Concerning matters of extortion in collecting public revenue, the report indicates that officers had free rein of any methods at their disposal (Marx 73). Torture became a method for financial exploitation in colonial India, and was challenged by a petition from the Madras Native Association presented in January of 1856. The petition was dismissed on the basis of a lack of evidence, despite the fact that, according to Marx, “there was scarcely any investigation at all, the Commission sitting only in the city of Madras, and for but three months, while it was impossible, except in very few cases, for the natives who had complaints to make to leave their homes” ( 74). Marx also refers to Lord Dalhousie’s statements in the Blue Books that there was “irrefragable proof” that various officers had committed “gross injustice, to arbitrary imprisonment and cruel torture” (76). In addition to torture, the Company levied extremely large taxes on the Indian people. Collier describes taxes as “a cynical outrage. A man could not travel twenty miles without paying toll at a river ferry, farmed out by the Company to private speculators. Land Tax, often demanded before the crop was raised, was made in quarterly installments … the annual rent for an acre of land was 3 s[hillings], yet the produce of that acre rarely averaged 8 s[hillings] in value” (Collier 20). Marx’s position, as illustrated by the introductory quote to this page, is that the Indians were victims of both physical and economic forms of class oppression by the British. In Marx’s analysis, the clash between the soldiers and their officers is the inevitable conflict that is the result of capitalism and imperialism. The military history of the rebellion is straightforward. Prior to the “mutiny” at Meerut on May 9th, 1857, fires broke out on January 22nd near Calcutta. An incident occurred on February 25th of that year when the 19th regiment mutinied at Berhampore, and the 34th Regiment rebelled at Barrackpore on the 31st of March. At Berhampore, the regiment allowed one of its men to advance with a loaded musket upon the parade-ground in front of a line and open fire on his superior officer; a battle ensued. April saw fires at Allahabad, Agra, an Ambala, but the spark that lit the powder keg went off on May 9th in Meerut. Members of the 3rd regiment of light cavalry were awaiting sentencing and imprisonment for refusal to obey orders and to put the Lee-Enfield .303 caliber cartridge into their mouths. Once imprisoned, the 11th and 20th cavalry assembled and broke rank and turned on their commanding officers. After liberating the 3rd regiment, chaos ensued in Meerut, and the rebels engaged the remaining British Troops. Meerut was the singlemost evenly balanced station in India in terms of the numbers of British and Indian soldiers. Troops and rebels were on near-even terms with 2,028 European Troops versus 2,357 sepoys, but the British had 12 field guns and the sepoys had no artillery. Both Collier and Marx indicate that the rebellion would have ended there had Major-General William Hewitt cut off the rebel army at the bridge between Meerut and Delhi, some 40 miles away, with added weapons (Collier 40). The 38th, 54th, and 74th regiments of infantry and native artillery under Bahkt Khan (c.1797- c.1859) joined the rebel army at Delhi in May. June 1857 marked the battle of Kanpur (Cawnpore). The last Maratha prince, Baji Rao II, decreed his title and 80,000 pound annual pension to his son Nana Sahib (c.1820- c.1859) and was refused twice. Despite Sahib’s attempts to push his claim, Lord Dalhousie refused the Hindu nobleman. Thus, in June 1857, Nana Sahib led the sepoy battalions at Crawnpore against the British. Nana Sahib sent word to Sir Hugh Wheeler, commander of the British forces at Cawnpore warning of the attack, guaranteeing him safe passage. On June 27, Nana Sahib broke the pact and trapped Wheeler in his palace. The events leading up to Wheeler’s surrender and death have been recorded as the Cawnpore Massacre. Andrew Ward’s historical narrative, Our Bones Are Scattered, also relates an account of the terrible and bloody massacre that followed the rebellion at Cawnpore, as well as Delhi and Meerut. By July, when Nana Sahib had captured Gwalior, he was reinstated as prince. The siege of Lucknow lasted roughly from July 1st to August 31st. The commanding British officer, Sir Henry Lawrence, died early on during the siege. By July 25th two-thirds of the British forces had retreated across the river and Delhi had been taken by early September. Bahadur Shah, the last surviving Mogul ruler was installed as ruler and the devastating battle between rebel and British forces for control Delhi ensued. Soldiers faced down the horrific sight of the impregnable walls of Delhi and “more than fifty guns and mortars belching fire at Delhi’s northern walls from the water bastion on the east to the Mori bastion on the west” (Collier 246). As the siege wore on the Punjabi forces fighting for the British began to weary and there was talk of a retreat. Under General John Nicholas, Delhi had toppled by September 20th, at the cost of 3,835 soldiers, British and Indian, and 378 horses (Collier 264). Rebel forces retreated to Lucknow where the siege was approaching three months in length. There the war lasted until late November, until the rebels were driven to defeat in the Ganges Valley in December and January by Hugh Rose and Colin Campbell. By July 8, 1858, a peace treaty was signed and the war ended. By 1859, Rebel leaders Bahkt Khan and Nana Sahib had been slain in battle. Though the Sepoy War has been dismissed as a chaotic, disorganized peasant uprising, several facts go undisputed that offer a counterargument. The “unorganized peasants” of India fought one of the most powerful empires in the world to near defeat with limited resources and even more limited training. Nevertheless, the lesson of the Sepoy War is not one of victory or justice, but failure. Though the exact cause of the Sepoy War has yet to be agreed upon, and it is likely that there were many complex causes rather than one, it is clear that British interference government and the oppression of the Indian people, religious and economic, created a bloody revolution. Alavi, Seema. The Sepoys and the Company: Tradition and Transition 1770-1830. New York: Oxford U P, 1995. Kaye, Mary Margaret. Shadow of the Moon. New York: St. Martin’s Press, 1979. Raikes, William Stephen. 12 Years of a Soldier’s Life In India. Boston: Ticknor and Fields, 1860. Campbell, Sir Colin. Narrative of the Indian Revolt. London:George Vickers, 1858. “Indian Mutiny.” Encyclopædia Britannica. Encyclopædia Britannica Online Academic Edition. Encyclopædia Britannica Inc. Web. 23 Mar. 1998. <http://www.britannica.com/EBchecked/topic/285821/Indian-Mutiny>. Kaye, John William. A History of the Sepoy War In India. London: W.H. Allen & Co., 1878. “Lee-Enfield rifle.” Encyclopædia Britannica. Encyclopædia Britannica Online Academic Edition. Encyclopædia Britannica Inc. Web. 23 Mar. 1998. <http://www.britannica.com/EBchecked/topic/334620/Lee-Enfield-rifle>. Marx, Karl & Freidrich Engels. The First Indian War of Independence 1857-1859. Moscow: Foreign Languages Publishing House, 1959. Stokes, Eric. 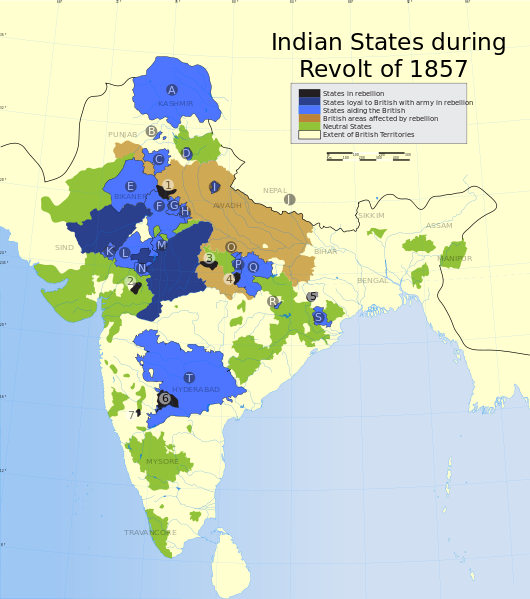 The Peasant Armed: The Indian Revolt of 1857. Oxford: Clarendon Press, 1986.